As I said on my last post, I am really enjoying British Columbia, the mountains interspersed with forests, the rocky terrain, sinuous roads, wildlife, buddies to ride with, what else does one need. I passed a few more bears but they were close to the forest and usually would run away, this one was close to the road, I got a picture of him while still riding but by the time I stopped he was gone. We continued to pass construction areas and steel grate bridges as we approached Muncho Lake. The Heidenau tires with the aggressive full knobby design tend to wonder quite a bit and takes getting use to it, an inexperienced rider might over react when passing other cars on a bridge and the bike is moving all over but I had no problems, light hands on the handlebars and maintain the speed. As we get closer to Muncho Lake we pass various rivers and the terrain becomes very rocky, the facade of the mountains very vertical and pure rock, a strong contrast to just a few miles before. We stop to rest and I stop a few hundred yards ahead of the other guys, I needed to get a picture of the other bikes to show a better perspective and to better show the size of the mountain. You can see the other guys on the second picture. We stop again when we first see Muncho Lake, the water has a beautiful blueish color, unfortunately the sky had become cloudy and that is not good for photography. Our next stop is at the Northern Rockies Lodge on Muncho Lake, we take a few pictures by the boat dock and then stop in front to admire the lodge, a log building with a beautiful facade. 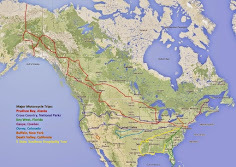 The website says the log building is the largest Hotel on the Alaska Highway, website here. A few miles down the road I make a quick stop when I see a black bear on the side of the road. My friends were ahead of me but when they saw the bear they turned around and came back to where I was, a few yards from the bear. The bear didn't care for us, he continued foraging and kept moving forward along the edge of the road. We pass Muncho Lake and a little latter come upon a Bison herd, the last time I had seen Bison was in Yellowstone two years ago during my cross crountry trip. As I approached, there's a male Bison crossing the road, I stop on the side and wait for him to cross, you don't want to mess with these guys. The rest of the herd was on the right side of the road and kept moving closer to us, we stood there taking pictures with engines running just in case. Bison can be belligerent and unpredictable specially when their offspring are nearby. 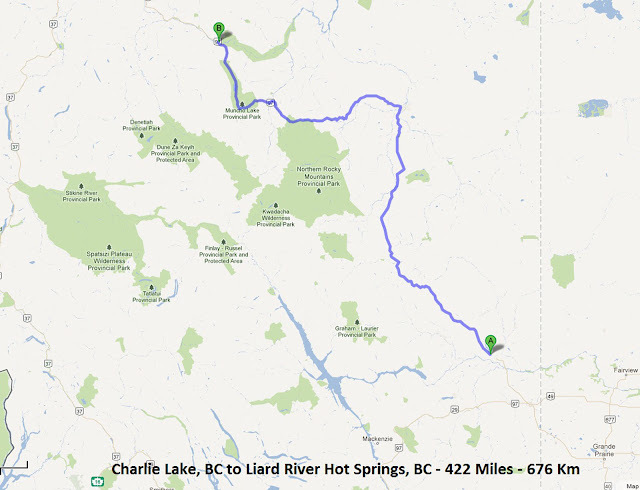 We finally reach our destination for the day, Liard River Hot Springs Provincial Park. The park is home to the second largest hot spring in Canada. We circle the campsite looking for a place and find a campsite that will fit all four tents. We are in the middle of setting up the tents when a familiar GS400 pulls up to our campsite, Jean Paul tracked us down. The site was big enough, we invite him to share the site with us, I was sure we were going to hear stories from this kid. John's Yamaha FZ1 needed a new tire, he had been carrying the tire wrapped to the back of the bike. John had bought the FZ1 from his buddy Pete who was very familiar with the bike. It was time to change the tire, why not do it at the campsite. I had never seen a tire changed so fast, these guys knew what they were doing and obviously had the tools with them. I was impressed. It was time to hit the hot springs, after all that was the reason we picked this place. We found out later there are no showers in Provincial Parks, not to worry though, the water was so hot that I think I lost a few layers of skin in the pool. The water was extremely hot close to where it's coming out of the ground, no one could get closer than 10 or 15 yards and even then you had to keep moving the water around you. According to Wiki the temperature ranges from 42°C to 52°C. We had a good time challenging each other to move closer to the spring and telling Pete, the last to arrive at the pool, to jump in the deep end, luckily he didn't fall for that. There's a long boardwalk leading from the campsite to the pools through a lush forest. The first boardwalk and pool facilities were built by the United States Army in 1942. 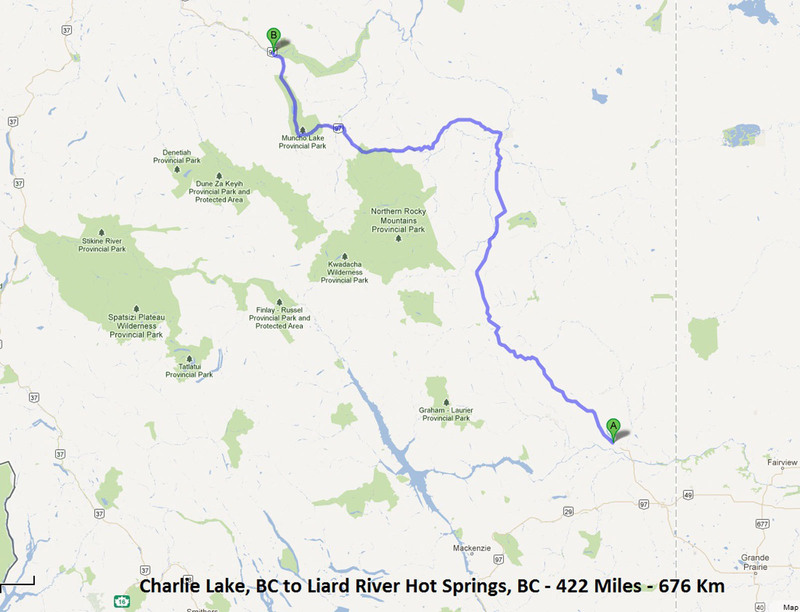 The Liard River Hot Springs were originally named the Theresa Hot Springs. It was time for dinner, we walk back to the campsite and Pete goes looking for a place for us to have dinner or buy food. After inquiring at the registration office he comes back and tells us the closes place to buy food is 60 miles away and the little native restaurant across the street has no food either. Today we made a big mistake, we hadn't stopped to buy anything. Luckily Paul (Limey) had the ready to eat meals and he happened to have four of them. The meals are the ones you can buy at sporting goods stores, you just add boiling water and you have instant dinner. Jean Paul had no problems, he pulls out a loaf of bread and a jar of honey a friend had given him, sticks his hunting knife in the jar and proceeds to spread honey on slices of bread. We all look at him with amazement, this kid is prepared for anything. Later we all try pieces of bread with honey, it's actually quite good. I am wearing my socks because the mosquitoes were out to get us. David, riding a BMW GS had arrived after us and was camping on the site to the left, you can see his orange tent in the background. He comes over and after introductions joins the fun. He is on the way to Alaska on his own and today would not be the last time I ran into him. More than a week and a half later we would ride together for 3 days. Five bikes, five tents and $20 for the site, not bad, the four of us split the $20 and Jean Paul stayed for free. He more than paid with his stories, we could listen to him all night. I did 422 miles today and was lucky enough to meet up with Paul on the road. Met two great guys, picked up Jean Paul along the way and spent the last hours of the day in hot water with friends, can it get any better? Yes it can, we will not forget to buy food again, we will not make the same mistake again, the dinner at our next camping night was fit for a king, thanks to John. 442 miles seems like a long ways in Northern BC but I guess it isn't that far if the roads are good. Those sheer rock faces by the sides of the road are huge. Natures majesty is a wonder. Thermal pools/hot springs frighten me. I think I have an aversion to sitting in water people have probably peed in, lol. We have a few in our area, but you couldn't pay me to get in them. I am glad you enjoyed it though. I can see how it would ease the sore muscles. Nice posts. I ended up skipping this area even though Muncho Lake is one of my favorite areas. Nice photos of the bears. @Trobairitz The flow rate from the hot springs is actually pretty high judging by the waterfall from the really warm section to the cooler sections. Laird is pretty nice though I rarely stop there due to the crowds. The crowds weren't bad, you can see on the panorama pic I took, the place is almost empty. The first time I saw the glacial waters in the rivers of BC I was amazed - I still think it's the most beautiful blue in the world. (And more bears .... and bison) Great photos and great memories. The blue is a cobalt blue, simply amazing.